EU Implosion -- Could Italy Drop The Euro And The EU? The NEXT Leader Of The New World Order? Why do some nations hold more gold? Wall Street’s Calling the Sheep to the Slaughter — Again! ANONYMOUS - The NEW WORLD ORDER 2016 Agenda is Nearly Complete! I recently spent several weeks in Italy, taking the pulse of the country. The Italian referendum on December 4 turned out exactly how I predicted it would. The “No” vote won in a landslide, with 59% of the vote versus 41% for “Yes,” with a 70% turnout. The pro-EU Prime Minister promptly announced his resignation after the crushing defeat. A surging populist party waits in the wings. They're now likely a matter of months away from taking power and then holding a new referendum on whether Italy should dump the euro and go back to the lira. If that happens, Italians will likely vote to leave. Without Italy, the euro currency would likely disintegrate. Without the euro, the whole European Union—the world's largest economy—would likely come unglued. Italy’s referendum is likely just the first of many dominos to fall. The Italian banking system is a mile-high house of cards. It’s looking wobblier every day. The triumph of the “No” side will also accelerate the crises in the Italian banking system, which was already on the verge of collapse. The collapse now appears imminent. It could start as soon as this weekend. Banca Monte dei Paschi di Siena (BMPS) will likely be the spark that sets it off. BMPS—Italy’s third-largest and most troubled bank—is likely to announce in the coming days whether it has successfully raised enough capital to remain solvent. My view is that this would be highly unlikely. If the capital raising efforts fail, there’s only one way to keep BMPS—and the entire Italian banking system—from collapsing… a bail-in. A bail-in would have a catalyzing effect, like political nitroglycerin. If and when it happens, expect support for anti-euro Italian populist parties to skyrocket. GDP measures a country’s economic output. However, it’s highly misleading. Mainstream economists count government spending as a positive when calculating GDP. A more honest approach would count government spending as a big negative. In Italy, government spending accounts for a whopping 50%-plus of GDP. A more accurate debt-to-GDP ratio would exclude government spending from economic output. I suspect that figure would reveal the Italian government’s hopeless insolvency. I don’t see how it’s possible for the Italian government to extract enough in taxes from the productive part of the economy to ever pay back what it’s borrowed. Yet Italian government bonds are trading near record-low yields. Over $1 trillion worth of Italian bonds actually have negative yields. That’s completely insane. With the failure of the referendum I expect that the Italian government bond super bubble has now found its pin. First, the European Central Bank will have to put the printing presses into overdrive to accelerate its program to buy Italian government bonds. It will also create an incentive for other governments to be reckless, assuming the ECB has their backs. This, of course, will hurt the value of the euro. The alternative is that the Italian government will have to acknowledge its bankruptcy. This would humiliate the mainstream parties and vindicate the populist parties, which have made defaulting on Italy’s unsustainable debt one of their planks. Either outcome is very bad news for the Eurocrats. A populist tsunami is washing through Europe. It will drastically change the Continent’s political landscape in a way not seen since before World War II. This wave will flush away traditional “mainstream” parties and usher in anti-establishment populists who want to leave the euro currency and the European Union. It’s already hit the UK in the form of Brexit, killing David Cameron’s pro-EU government in the process. It struck Italy earlier this week, washing away pro-EU Matteo Renzi. The momentum is clearly building for this anti-elite surge. It’s like a hurricane gathering strength. I think the failure of the Italian referendum is the tipping point. It will make this trend unstoppable. Voters in Europe’s biggest countries could soon throw out their “mainstream” parties in favor of populist and Eurosceptic alternatives. 2017 will be a decisive year. Voters go to the polls in major elections in the Netherlands (March 15), France (April 23), and Germany (between August 27 and October 22). Anti-euro populists have a real chance to win in any of those countries. If they win in even one, the EU would likely unravel. My thesis for the collapse of the EU is getting stronger and stronger. We're now much closer to seeing - as one Italian politician recently put it - the euro melt away like a gelato left out in the August sun. I think the failure of the Italian referendum marks the beginning of the end for the currency. I expect the euro to tank soon. The European central bank meeting will not have any impact on metals and energies. Their growth and inflation targets of next year will be unreliable. France and Germany goes to elections next year. France will get a new leader. Choppy times ahead for euro. Safe haven demand will either go the US dollar or gold. The next week is very crucial for silver. If silver manages to trade over $17.00 for a week, then another short term bull could be there with $19.76 and $21.05 as possible targets. For now I will be extra careful trading in silver. Two words - "nailed it"
As FoxNews notes however, while President-elect Donald Trump was named Time magazine's Person of the Year on Wednesday, the honor basically ended there. While describing Trump as the real change-maker of 2016, the magazine also ragged on the Republican president-elect as a "huckster" and "demagogue" while reserving its most glowing praise for runner-up Hillary Clinton -- whom the edition breathlessly described as "an American Moses." In describing Trump, Time's article almost exclusively used backhanded compliments. For instance, while the piece said he "did what no American politician had attempted in a generation," it added that he "magnified the divisions of the present, inspiring new levels of anger and fear within his country." The article on Hillary Clinton is much different. Subtitled "The winner of the popular vote leaves a complicated legacy," the tone is worlds away from the fulminating darkness that permeates the Trump piece. The opening paragraph reads more like the prologue of St. John's Gospel than an essay on a presidential runner-up, saying of Clinton: "she became a symbol in a fight that was about much more than symbolism." "She's the woman who was almost President, she is what might have been and what will yet be." "Like an American Moses, she was an imperfect prophet, leading women to the edge of the Promised Land. Now it's up to another woman to enter it." The big question is, will TIME name Putin 'Man of the Year' in 2017? Jewellers sold 15 tonnes of gold ornaments and bars, worth around 5,000 crore rupeees, on the intervening night of November 8 and 9 after the government demonetized Rs 500 and Rs 1,000 denomination notes, said Surendra Mehta, national secretary of India Bullion & Jewellers Association. The association has 2,500 jewellers registered with it from across the country. "We estimate gold worth Rs 5,000 crore, or around 15 tonnes, was sold between 8 pm on November 8 and 2-3 am the next day, after the prime minister's demonetization announcement," Mehta told The Times. He said nearly half of these sales happened in Delhi, Upper Pradesh, and Punjab. He claimed that only 1,000 of around 6 lakh jewellers across the country had accepted Rs 500 and Rs 1000 notes in exchange for gold on the night of November 8. The designation/callsign “Air Force One” has been around since around the time of WWII, with FDR being the first president to fly while in office. Since 1943, with only a couple exceptions, the Air Force has been flying custom versions of Boeing commercial airliners for the presidential flight mission. Most recently replaced in 1990, the president currently flies in a modified 747 with the military designation “VC-25”; two copies were produced for a cost of $325 million apiece, and the callsign “Air Force One” is only used when the president is onboard. Even though it is still extremely advanced, Air Force One is due for a replacement. Currently, the operating cost for each VC-25 is $210,877 per hour; an extremely high figure, likely because of the dated nature and high maintenance costs of both the airframe and the avionics suite. However, with a total program cost estimated to be around $4 billion dollars, Boeing is clearly gouging the taxpayer. The newest derivative of Air Force One will end up being over six times as expensive as the last one, which was built on the same airframe. I guess Boeing just thought the higher price tag was going to slip through the cracks of a bloated DoD budget? The older 747-200 the current VC-25s were derived from has been out of production since 1991, with the 747-8 being the current variant under production. Boeing has considered ending production of the 747 altogether, once its current backlog of 21 aircraft orders (including the VC-25 replacements) is fulfilled. The relative inefficiency of the 747 is the top reason for its decline. It has lost the highest trafficked overseas routes to the Airbus A380, which the 747 once dominated. Also, commercial and cargo airlines have largely switched to more efficient Boeing 777s and 787s, as well as the Airbus A340 and A350, with twin engines and newer, more efficient designs cutting their costs far below that of the 747. While it could be argued that the Air Force should modify a twin-engine Boeing jet such as the 777 or 787 instead, their desire for a larger four-engine jet to transport our nation’s leader is understandable, given the dangers the jet could face. Which one of the two pictured is “Air Force One”? Critics have come out in force to justify the ridiculous cost of the Air Force One program, though they seem more interested in criticizing the president-elect than they do in explaining the aircraft’s price tag. In a USA Today article detailing Trump’s attack on the cost of the AF1 program, aviation analyst Richard Aboulafia didn’t provide any evidence to support an increased cost for the jets, instead choosing to criticize the president-elect for daring to mention that the aircraft is grossly overpriced. Richard Aboulafia, aviation analyst at the Teal Group, said the current Air Force One planes were made in the 1980s and have become obsolete. The planes are equipped with state-of-the-art communications technology and defense mechanisms to survive nuclear war or terrorist attacks, he said. Anything in the $3 billion to $4 billion range would be reasonable, and a belief otherwise is “completely ignorant,” he said. Aboulafia wants you to believe that not only has the cost of replacing Air Force One gone up so drastically due to inflation, higher materials costs, redevelopment of an existing airframe, or whatever ridiculous expenditure he didn’t cite, he seems to be implying that the current VC-25s don’t already have similar EMP and nuclear/biological/chemical protections built into them already. Of course, AF1 has all of that and more, and it is by far the most sophisticated VVIP transport plane in the world, even at 25+ years old. Even the aircraft’s maintenance crews know that despite its age, it is anything but obsolete. There was no mention from USA Today that even the original contract estimation of $1.65 billion dollars for the pair of VC-25s was already a significant markup upon an airframe that had been previously modified by the Air Force for the AF1 role, and should not have been nearly that expensive to do again in the first place. Bear in mind, as USA Today stated, the US Government Accountability Office (GAO) recently reappraised the program’s cost to the $4 billion dollar figure, noting it would be “including $2 billion for research and development”. How exactly is this price tag considered “reasonable”? For reference, the other “most expensive” airplane in the Air Force’s inventory, the B-2 Spirit stealth bomber, is estimated to cost about the same $2 billion per copy as the new VC-25s. However, the high per-unit cost of the B-2 is due to the buy being cut from 132 to 21, after the end of the cold war, averaging a high R&D cost across a much smaller number of aircraft. Had the Air Force bought even another 20 of the planned units, they could have been purchased for $566 million each. Coincidentally, the Air Force’s new stealth bomber, the B-21, is estimated to cost about $511 million a copy (before the appropriate cost overruns, of course). So the MSM, and our government for that matter, is OK with a replacement Air Force One being six times as expensive as its predecessor, and about as costly as four new copies of already ridiculously overpriced stealth bombers. And the MSM is also somehow critical of the president-elect for bring this to light. Is it any wonder they feel the need to defend their bias by calling alternative coverage “fake”? Trump is correct to call out Boeing for this injustice they are doing to the taxpayer. Not only is he calling attention to another runaway military expenditure, he is putting all government contractors on notice. Whether the MSM believes the president should be focusing his attention elsewhere or not, he is demonstrating that he is not afraid to call out any contract size or any contractor for gouging the taxpayer. Hopefully, Trump’s conduct will keep government contractors’ heads on swivels, and wary of the repercussions of overbilling on government contracts for as long as he is president. Still, our government spends close to $4 trillion annually, and Trump cannot be everywhere at once. Don’t be surprised when reports of more over-budget, behind schedule government programs appear during his presidency. The post In The News Today appeared first on Jim Sinclair's Mineset. This post Spotted: Bad Omen for Stocks appeared first on Daily Reckoning. Market consensus — a seductive yet treacherous siren — says Trump's big spending will keep stocks in what David Stockman calls the "nosebleed section." Hussman dissents. The post-election stock rally rests upon stilts, and the stilts upon sand. Stocks are overvalued, says he. Bond yields have spiked in expectation that Trump's spending plans will finally goose inflation. The yield on the 10-year Treasury note is currently 2.37% — which starts to flirt with danger as far as stocks go. And lame duck Yellen will likely raise rates, as indicated. As Goldman explained recently, “A rise in U.S. bond yields above 2.75% would create a more serious problem for equity markets." It says a 3% rate would spell a 10% correction on the S&P. Refresher: The Dow plunged 22% on Oct. 19, 1987 — "Black Monday." The tech bubble started to burst in March 2000. Almost forgotten is last July's episode Hussman mentions. At 12%, it met the definition of a correction — a 10% market drop. A repeat performance would drop today's S&P 265 points in a New York minute. In any given week, the single most likely market outcome is actually a small gain, even though the average outcome is negative… Simply put, don't be lulled into complacency by thinking that severely hostile market conditions have to resolve into immediate market losses. That's not the way these environments work, and they never have. Every market crash in history has been associated with essentially the same [pattern.] It's the positive "mode" that creates complacency… and it's the fat left tail that strikes out of nowhere. The "fat left tail" being a reference to the standard bell curve distribution pattern. A "fat tail" event means it's way out on either end of the bell curve — highly unlikely. A fat right tail event is winning the Powerball. A fat left tail event is a piano falling on your head. Hussman's warning about the piano, and that's where those "wicked vertical losses" enter the scene. In October, we reckoned about fat tail events. The conclusion: They strike markets significantly more often the laws of chance would suggest: "[Markets] operate in the world of fat tails, exhibiting large skewness… This is a fancy way of saying extreme events are much more likely to occur than a normal distribution would predict." The post Spotted: Bad Omen for Stocks appeared first on Daily Reckoning. This post Wall Street’s Calling the Sheep to the Slaughter — Again! appeared first on Daily Reckoning. I believe the shock of Donald Trump’s election will soon be vastly exceeded by an even more shocking shutdown of Washington governance within days of the inauguration. For the first time since the 1930s there will be a crash on Wall Street and a recession on main street, but the Imperial City will be powerless to remedy either. That’s because financial history is not circular; it’s cumulative and all the fiscal and monetary artifices, expedients and frauds that can be deployed by the state to maintain the illusion of prosperity and soaring financial asset prices will have finally been exhausted. With the Fed pitifully impaled on the zero bound for 96-months running, it has become evident to even the bubble vision cheerleaders that the massive monetary stimulus of the last two decades is over and done. The only thing left in the Fed’s arsenal is sub-zero interest rates, and that option does not have even a remote prospect of getting off the ground. Donald Trump won the election against all odds, and that he did so on the back of a populist uprising that is unmitigated bad news for Wall Street. Brandishing whatever the present day equivalent of torches and pitchforks might be, the people will surely descend en masse on the Eccles Building if the Fed even hints at the possibility of imposing negative rates on savers and retirees. Nor can the market be rescued through the backdoor of some kind of antiseptic QE that showers gamblers with unspeakable windfalls and stir the populist political pot to a full boil. The obvious dead-end of monetary policy, in fact, is why there has been such frenzied rotation to the Trump reflation trade after the election. The idea of a massive Trump stimulus was literally invented on the spot late on election night by Wall Street operators in order to attract gullible homegamers into the casino one last time. But the smart money will soon be done selling and the unvarnished Washington disaster looming dead ahead will come screaming back into view. Even if Donald Trump had a semi-coherent economic program, which he clearly doesn’t, there is not a chance that he could get it through the Congress. What passes for the nation’s highest legislative body will be riven with unprecedented partisan rancor and dysfunction from the moment it convenes in January. In part, that’s because the Democratic Party will be captured by the ultra-partisan left. Shrill anti-Trump scolds like Senator Elizabeth Warren will make it their one and only mission to ensure that Trump fails and that what they consider to be the freak accident of November 8th is literally extinguished. But high decibel partisanship isn’t the half of it. It is virtually certain that the GOP majorities in both Houses will become fractured and immobilized by the trauma of the impending fiscal bloodbath. The razor thin GOP majority in the Senate would have been stillborn under any circumstances owing to the 60-vote hurdle. But in the House even the new 241-194 GOP majority will never withstand the blunt force trauma of Trump’s wildly irresponsible fiscal program slamming smack dab into the jaws of $1 trillion annual deficits. We're seeing the return of the bond vigilantes — a metaphor for a condition of rapidly rising deficits and simultaneously rising interest rates. However, the bond vigilantes have been absent from the scene for so long that historical memory of the resulting political blowback has undoubtedly been lost in the Imperial City and the mainstream media which celebrates its follies. Yet know this: Washington’s fiscal bloodbath is coming to the cable news coverage-athons soon. The commentariat will be shocked and flummoxed by its arrival, having embraced the all-is-awesome recovery myth so completely that it is unaware of the stunning fact that the public debt rose by $1.7 trillion during the last two years alone. That is, Uncle Sam issued monumental amounts of new debt during months #63-87 of a recovery that has already outlasted the typical 61-month post-war expansion; and did so during the late stage phase of the cycle where even traditional Keynesians said deficits should be eliminated or minimized in order to preserve dry powder for the next downturn. Stated differently, for all practical purposes fiscal policy has replicated the folly emanating from the Eccles Building by remaining in emergency mode right through the entire business cycle recovery, rendering it paralyzed in the teeth of the next recession. But the fact of that folly has remained obscured by Washington’s resort to budgetary accounting shenanigans that pale into insignificance the infamous frauds of Enron, WorldCom, Tyco, AIG, Valeant and Bernie Madoff combined. For instance, last year Uncle Sam financed $96 billion of new student loans, but only $15 billion of that was charged to the deficit. That’s because in its wisdom Washington determined that student loans are an “investment” and only a small “provision” need be taken for potential future losses. Right. The Democratic Party has adopted Bernie’s “free stuff” when it comes to college tuition and even Donald Trump has proposed a vast forgiveness scheme that would cap student loan repayments at 12% of income for a limited number of years, and cancel the rest. So piling $100 billion per year of additional student debt on top of the $1.3 trillion outstanding is deficit spending by any other name. And Congress ordered the Fed to transfer $19.3 billion of purely fictional accounting reserves to the highway trust fund in order to keep it “solvent” until next year. Yet that deception was on top of the underlying fraud. That is, the transfer of the Fed’s annual “profit” after expenses to the U.S. Treasury. That amounted to $97 billion last year, and it was neither real nor sustainable. To the contrary, the transfer was just make-believe accounting “profits” that result from the $119 billion of interest the Fed earns on its massively bloated $4.5 trillion balance sheet. Yet it is pleased to call this exercise in monetary magic an accounting profit and return it to the Capitol Hill politicians to offset the reported net interest expense on Uncle Sam’s massive $19.6 trillion debt. Here’s the thing. Now that the bond vigilantes have been resurrected by the Trumpflation story, even this fictional accounting profit is about to disappear. That’s because the Fed will now experience massive mark-to-market losses on its $4.5 trillion bond portfolio as interest rates normalize one way or another. Yet under its accounting rules, and appropriately so, it must charge the bond losses against it so-called operating profit. This means the Fed’s profit repatriation to the U.S. Treasury is about to shrink drastically. The jig will soon be up. Federal receipts during the last six months are down by nearly 2% because the current aging business cycle expansion is grinding to a halt. So based on spending and entitlements which are already built into the existing budget baseline, and given the prospect of stagnant revenues at best, I believe the first full budget (for 2018 ) that the Trump Administration will have to grapple with will show an inherited deficit of about $850 billion and a new borrowing requirement of nearly $1 trillion. And that’s before it spends one dime on infrastructure or tax cuts! And it’s also before another near certainty. Namely, when the stock market crashes in response to a breakdown of governance in the Imperial City and the disappearance of the massive stimulus story, the U.S. economy will slide into full-fledged recession. Then the deficit will be back into the trillion dollar plus category in a heartbeat. As I said, there is a fiscal bloodbath coming soon. The post Wall Street’s Calling the Sheep to the Slaughter — Again! appeared first on Daily Reckoning. Britain's trade deficit with the rest of the world is L6 billion larger than previously thought -- and at a record high -- because the nation's beancounters made a mistake in their sums. The Office for National Statistics yesterday admitted to a big "processing error" that meant it had miscalculated the value of everything that the country exports and imports for almost two years. For the three months to September, the correction catapulted the trade deficit from L11 billion to L17 billion, the worst since records began in 1955. The error comes at a particularly sensitive time for the ONS and the trade series in particular, which is being watched closely for signs of an export revival after the fall in sterling since Brexit. The Bank of England and the Office for Budget Responsibility expect an improvement in the UK's trade to cushion the economic blow of voting to leave the European Union. However, the ONS's mistake appears to have masked a catastrophic collapse since June. Gold gained $11.03 to $1180.13 by midmorning in New York before it drifted back lower into the close, but it still ended with a gain of 0.33%. Silver surged to as high as $17.216 and ended with a gain of 2.45%. This post You Take the Risk, Billionaires Collect the Profits appeared first on Daily Reckoning. The real estate "steal of the century" is moving into its final, most rapacious and decadent phase. Team Trump wants to hand over $5 trillion in assets to billionaires — assets for which you, dear taxpayer, are shouldering the risk. Pour yourself a tall serving of your favorite beverage and sit back for the ultimate tale of "privatized profits and socialized risk." "In a dystopian America of the near future, millions of foreclosed homes sitting on the federal government's books are flipped at fire-sale prices to hedge funds and private-equity firms with government connections." This was the earliest stage of a scheme hatched in Washington called "REO-to-rental." The idea is that these big-bucks investors would buy the single-family homes at a deep discount and then manage them as rentals. Think back to early 2012. Wouldn't you have loved to buy the foreclosure property around the block and rent it out in hopes of generating the income you could no longer get from a CD or a money market fund in our brave new zero-interest-rate world? Sorry, you didn't qualify. These foreclosures were available only to investors able to drop at least $1 billion on a bulk transaction with Fannie Mae, Freddie Mac or the Federal Housing Administration. Five years later, "big investors have spent at least $32 billion buying and fixing up homes," says this morning's Wall Street Journal, "and they own between 1% and 2% of all U.S. rental homes, analysts estimate." The biggest investor of all is Blackstone Group — which might let you collect a paltry cut of the rental income now. Blackstone has dropped $10 billion on about 50,000 REO-to-rental properties through its Invitation Homes LP unit. Now Invitation Homes has filed plans to go public as its own company. It wouldn't be the first. Less than a year after the feds rolled out REO-to-rental, Silver Bay Realty Trust went public under the ticker SBY. Others have followed, including American Homes 4 Rent (AMH) and Colony Starwood Homes (SFR). Whatever income these companies pull in from their rentals, they don't hand over much of it to their retail shareholders. SBY and SFR have yields of just under 3% — about the same as a 30-year Treasury bond. AMH has a yield of less than 1%. So… Wall Street feasts off Fannie and Freddie… while mom and pop get crumbs. At this point in our story, it's worth recalling just how Fannie and Freddie operate. As you might already know, Fannie and Freddie are GSEs, or "government-sponsored enterprises." They provide insurance-like guarantees on $5 trillion in mortgages. They collect money upfront in exchange for a promise to pay on any credit losses. Well, that's the sugarcoated description. Here's how our own David Stockman describes it: "They stamp what amounts to a government guarantee on trillions of dollars in mortgages and then collect a fee for doing nothing except putting taxpayers in harm's way." Still, for decades, it was good business. Easy money. Then came the real estate bubble, followed by the Panic of 2008. Suddenly, taxpayers were on the hook for a $188 billion bailout. Fannie and Freddie booked huge losses from 2009–2011. But with the recovery of the housing market — if you factor out inflation, housing prices are back to the mid-2006 peak — Fannie and Freddie's revenues are way up and losses way down. Key point: Because Fannie and Freddie were nationalized in 2008, it's the U.S. Treasury booking the profits — to the tune of $255.8 billion since 2012. However… a few Wall Street sharks believe the profits really belong to them, even though you're the one at risk. And they'll stop at nothing to grab those profits. Fannie and Freddie are still publicly traded companies, even after the nationalization. The government owns about 80% of the shares… while booking 100% of the profits. The other 20% of the shares have been snapped up in recent years by hedge fund operatives like Bill Ackman. In part, it was a bet on a housing recovery… but it was mostly a bet that Congress would change the law and allow Ackman and Co. to collect the profits, instead of the Treasury. When Congress didn't act, Ackman and the others sued. Incredibly, they did so on Fifth Amendment grounds. "This whole hedge fund gambit is a Wild West speculation on worthless paper and the presumed mendacity of the nation's legislators," says David Stockman, "yet these Wall Street larcenists have the nerve to call an attempted theft from the public a 'taking' of their own private property." But the court case might soon become moot: Trump's pick for Treasury secretary, Steve Mnuchin, says he wants to hand the entire $5 trillion Fannie-Freddie candy store to Wall Street. Hours after he was named a week ago today, he was telling CNBC that Fannie and Freddie are one of his Top 10 priorities: "We will make sure that when they are restructured, they are absolutely safe and don't get taken over again. But we've got to get them out of government control." Allow Mr. Stockman to once again translate: "That's code for showering his hedge fund buddies with billions of windfall gains on the otherwise worthless stock of these two government housing finance zombies. "These misbegotten operations can't be 'restructured' and can't be made 'absolutely safe' as spinoffs to the private sector. That's because without some form of backstop from the U.S. Treasury, their whole business model would collapse." Note the choice of words by Mnuchin, the ex-Goldman Sachs man: "We've got to get them out of government control." He said nothing about ending the taxpayer backstop. Concludes Mr. Stockman: "We have been rooting all along for the Donald and his fulminations against the Wall Street/Washington ruling elites. But we have also insisted that he has no clue about how to actually 'drain the swamp.'" If that wasn't clear before, Mnuchin's priorities make it clear now. The post You Take the Risk, Billionaires Collect the Profits appeared first on Daily Reckoning. Brussels on Wednesday will hit HSBC, JPMorgan, and Credit Agricole with multimillion-euro fines for rigging the Euribor interest rate benchmark, closing a five-year cartel probe into a scandal that shook the financial world. The three banks held out against a 2013 settlement with the European Commission that imposed almost E1 billion of fines on Deutsche Bank, Societe Generale, and Royal Bank of Scotland. Margrethe Vestager, the EU's competition commissioner, is expected to unveil fines on the trio of banks ranging from tens of millions of euros to the low hundreds, according to people familiar with the case. -- Seven of Spades: Newly discovered zone with stacked flat lying quartz veins returning values up to 18.55 g/t gold. -- Queen of Spades: Newly discovered zone with values up to 30.8 g/t gold. -- Jack of Spades: Additional results from continuous panel sampling of a second higher bench returned 20 meters of 7.62 g/t gold including 11.7 g/t gold over 12.4 meters and 37.9 g/t gold over 1.7 meters. As an asset, gold is entirely speculative. It provides no income or dividends and has few industrial or medical applications. Investors buy it only in the confidence that humans' peculiar and enduring fascination with the lustrous metal will ensure its value through the decades and centuries to come. Unlike other securities, its price is not dictated to any large extent by supply and demand. "Gold trades more like a currency and its price is driven more by monetary considerations such as inflation, interest rates and exchange rates," writes Nitesh Shah, commodity strategist at ETF Securities. As "Trumpflation" expectations grow, along with anticipation that the U.S. Federal Reserve will begin hiking interest rates more rapidly next year, the gold price has duly fallen. Even a new Sharia standard for investing in gold, which could see some of the $2 trillion currently invested in Islamic finance assets reallocated to physical metal and other products, the price impact would be limited, said Shah. Its price may have fallen but people continue to buy gold. It has always been a hedge against fears of inflation, devaluation in paper currencies, and has outperformed (as a Federal Reserve Board study has found) during periods of market volatility. Rather, it is how we hold it that is changing. According to the World Gold Council, inflows into exchange-traded products -- a type of security -- were the main reason for the increase in demand during the third quarter of this year, while demand for physical gold in the form of bullion bars, coins, and jewellery fell sharply. Most gold analysts surmise COMEX 100-ounce gold futures contracts (GC) can only be physically settled through taking and making delivery. This is technically true when excluding the possibility of EFP trading in GC through the over-the-counter (OTC) market. While on Exchange trading in GC is "executed openly and competitively", trading GC in the OTC realm (and thus the price of the gold, its form and location) is a "privately negotiated transaction" between buyer and seller. The COMEX is a subsidiary of CME Group, which offers its clients OTC trading on a platform called ClearPort. The post Massive Dollar Selling Ahead-John Williams – USAwatchdog.com appeared first on Jim Sinclair's Mineset. Emerging markets across the globe are already suffering because of an expected rise in US interest rates -- and few are feeling the pain more than Turkey. The country's currency has been plunging in the wake of the election of Donald Trump, who favors fiscal stimulus rather than ultra-low interest rates, and ahead of a Federal Reserve meeting next week that could raise benchmark rates for only the second time since the financial crisis. In response, President Recep Tayyip Erdogan has called on citizens' patriotism to foil the effect on the lira. He has exhorted them to break what he describes as the "tyranny of the dollar," asking people to stock up on the lira and gold instead and so defeat the "economic sabotage" perpetrated by the country's enemies. While OPEC production cuts could slow the plunge of Nigerian naira, the real headwinds are ahead, thanks to the impending Fed rate hike, the incoming Trump administration and US dollar as the new fear index. In Africa, some 14 countries have been using the CFA franc that is pegged to the euro, while three have been pegged to the South African rand. Before the Trump triumph, the conventional wisdom was that as the US dollar would weaken against the euro in the short term, this will reduce inflationary pressures in these countries. However, skeptics argued that inflationary pressures were already low in most countries with a euro peg and a stronger currency would affect their competitiveness. 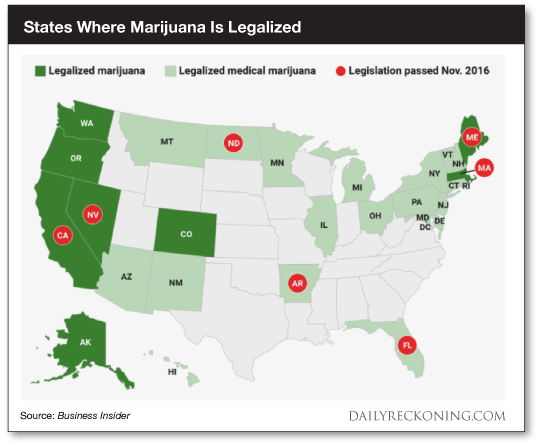 This post You Can’t Deny This Chart – Reefer Madness is Sweeping the Nation appeared first on Daily Reckoning. I woke up early to go for a run down Ocean Avenue. The sun wasn't due to rise for a couple of hours (I'm stuck on East Coast time). The streets were mostly empty– a small group of homeless drifters and a construction crew were the only other souls awake. But the smell of marijuana hung heavy in the air by Tongva Park. If you didn't know any better, you would have thought a reckless Telsa driver had just mowed down a family of skunks. The citizens of California finally voted to legalize recreational marijuana last month. But pot's no big deal in laid-back SoCal. A farcical medical marijuana program has been around forever here in the Golden State. For years, you could visit your local quack with all sorts of imagined ailments and snag a "green card" that would give you access to the dispensary of your choosing. But while pot is nothing new to Californians, legal pot is a very new concept to the markets. The 2016 election season officially opened the floodgates. The wave of legalization has crashed over the West Coast. California, Oregon, Nevada and Washington have all officially legalized recreational marijuana use. Back east, Massachusetts and Maine join the ranks of the high flyers. There's a lot of money to be made in the marijuana business, as any small-time drug dealer has know for years. The trick is figuring out how the heck to invest in a brand new industry as legal weed starts to spread across the country. A record-breaking 8 states passed new laws for recreational and medical use on Election night. Already dozens of tiny marijuana firms have begun skyrocketing by 100%, 300%, 500% and higher. This is your chance to turn a single $50 bill…into a fortune. There are many different types of legal weed entrepreneurs. They make and design packaging, manage dispensaries, and even run weed-based social networks. But the most important distinction in these businesses boils down to who touches the plant – and who doesn't. Those who touch the plant—the growers and distributors—are naturally assuming the most risk. And since marijuana remains illegal at the federal level, investors prefer the companies that don't touch the plant. But the industry insiders told us that they're not going away—and that their businesses are just getting stronger. Well over half the country is in support of legalization. About 60% of swing states are leaning in favor of legalization. As these businesses mature, they will split into recreational and medical focuses. Recreational marijuana will consist of consumer-driven lifestyle brands while medical companies will develop new products targeting treatments and health benefits of the plant and its chemicals. The marijuana business leaders agreed that despite the hurdles, we're going to see more entrepreneurs getting their companies listed on major exchanges. And full legalization on a federal level will happen in just five to seven years. It's time to start taking the pot business seriously. The post You Can’t Deny This Chart – Reefer Madness is Sweeping the Nation appeared first on Daily Reckoning. And many others are, too. Among their various characterizations of gold are the following: it is an unproductive asset; it doesn’t ‘do’ anything; it just sits there; it’s too volatile; stocks are a much better investment.